red skin, pale yellow flesh . Sprout: Purplish red, cylindrical, very strong hair. Plant: Medium height, semi-upright habit, leafy type. Stem: Weak pigmentation, with narrow, straight wings. leaflet average, elongated oval (I = 1, 90); limbus plan. disease Sensitivity: Mildew foliage: fairly susceptible. susceptible. Virus X: NTR Virus A: NTR Virus Y: fairly susceptible. 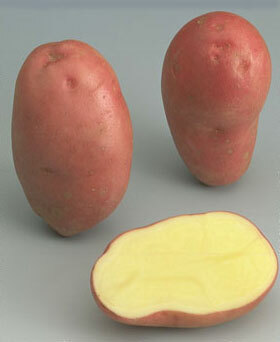 mid-early variety, giving large tubers with red skin, regular shape.